Its no coincidence that spy novels and hysteria were part and parcel of pop culture in the 50s and60s when at the height of the Cold War the world looked into the abyss as America and her allies stared unblinking at the threat of Soviet bases in tiny Cuba. Now, the world is facing yet another abyss. For those not leading but watching, it is a time to fear again. Bruce Jones has a new art partner for his ongoing Hulk series. It is Stuart Immonen. Immonen may not have the precision of outgoing artist John Romita Jr to chisel heroic, muscular heroes, but he makes up with an acute sense for atmosphere. He plays with light and shadows. Eyes that stare in horror and fear. Or blacked out by shades. Throughout issue #45, The Hulk doesnt appear in his own book and you wont miss him. This is Bruce Banners story [the man who transforms into the Hulk when agitated]. He wakes to find himself in a room with a strange woman. Whether drugged or weakened from lack of food, Banner slips in and out of consciousness, each time revived when Bobby Darins Dream Lover is played on his alarm radio. Until one evening, when Banner awakes to find his "dream lover" dead in bed with him. Then the police are outside banging on the door to get in. 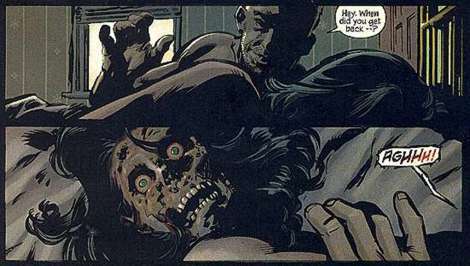 The nightmare is about to begin as the last page reveals a villain, recently "killed" in a previous issue. So what is "real"? The subtext of Jones Hulk is that when society feels threatened it bands together at the expense of those who appear to hold independent and individualistic views that do not follow the group-think. The colorful costumes and heroes have been replaced with muted brown tones and men in black with shades. Words like suspicious, furtive, paranoid are the new adjectives. Jones Hulk has elements of 60s television dramas like The Fugitive, The Prisoner and The Invaders. Each of those series had a protagonist who was running away while holding on or holding out for the "truth".